The pleasures here are many. John Lenehan is a very accomplished performer - not only is his technical address impeccable, but he also possesses a strikingly wide dynamic range and sophisticated variety of tone colour, both of which he uses to marvellously poetic (and never remotely self-conscious) effect throughout. That Lenehan has a considerable affinity for Ireland's muse is immediately evident from his raptly intimate delivery of the gentle opening diptych "In Those Days". Similarly, in the extraordinarily imaginative, harmonically questing "Ballade" of 1929 Lenehan rises superbly to the elemental fury of the remarkable central portion, with its brooding echoes of the "Northern Bax" from the same period. Elsewhere, "Columbine" is a treat, as is the ravishing "Month's Mind". The haunting "Prelude in E flat", too, is most affectingly realised. 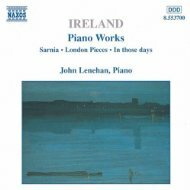 John Lenehan is making a complete survey for Naxos [of John Ireland Piano Music] and he proves the most persuasive advocate, warmly expressive, using rubato in a totally idiomatic way. Impeccable performances, vividly recorded.